When we discuss supply in real estate, we need to look at it many ways. The real supply is the total number of homes on the market, while the relative supply is the amount of homes on the market compared with the current rate of demand (and reported as months of supply). When we see 6.0 months of supply, we call this a balanced market or market equilibrium, and at this level sellers and buyers are competing on a level playing field. When the relative supply exceeds 6.0 months of supply, we refer to this as a buyer's market, where there are more sellers than buyers and there is pressure on prices. When relative supply goes below 6.0 months of supply, we refer to this as a seller's market, as buyers now outnumber sellers. This is the environment that reveals scarcity, and prices rise. 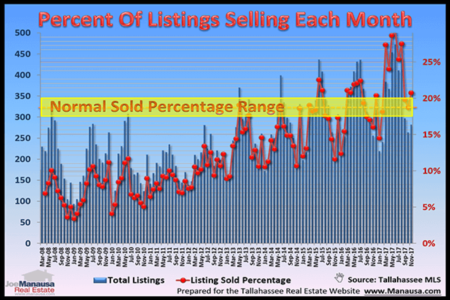 So take a look at the current state of real estate supply and demand in Tallahassee in order to understand the changes that are happening and how property values will likely change this year. 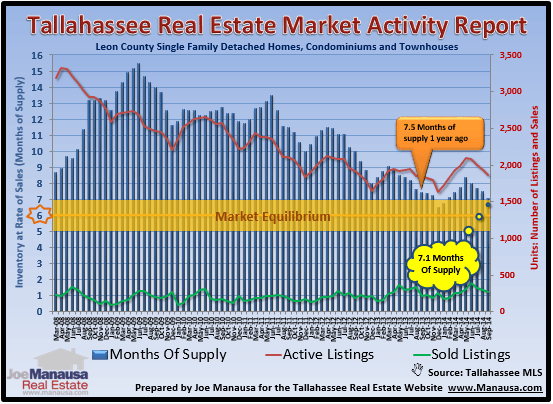 The following real estate graph and tables demonstrate housing supply and demand dynamics in the Tallahassee real estate market as of January 5, 2014. Each area of Tallahassee (Leon County, Florida) is summarized with homes for sale (red line measured on the right vertical axis), homes that have sold over the past 12 months (green line measured on the right vertical axis), and finally the relative supply of homes for sale (the blue columns measure “months of supply” on the left vertical axis). 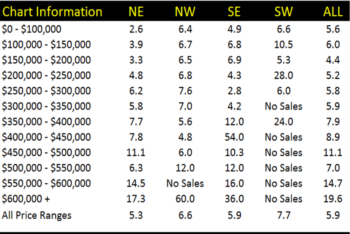 We measure demand by looking at home sales over the past year. By using a full year's worth of data, we remove seasonal fluctuations from the data. We measure supply each month, and it clearly moves with the seasonal changes in seller behavior. Because of this, the blue columns (months of supply) start the beginning of the year low, move up during the Summer selling season, and then decline at years end. We can see this pattern repetitively above. But the blue trend line reveals where supply and demand are heading ... and that is back towards market equilibrium. The one year trend (the average over the past year) of the relative supply of homes for sale in Tallahassee is just over 7 months of supply, which means we remain in a buyer's market. While this is true for the overall market, it is not true for every price range and every area. For this reason, if you are thinking of selling a home, you need to get a real estate agent to help you determine your best asking price. Computer pricing tools are fine if you want to know a generalized value for your home, but to find out what buyer's will be willing to pay, you need an agent to see inside your home and then analyze the supply and demand for homes similar to yours. If you would like to know what your home would fetch in today's market, you can check out our free home valuation service here.